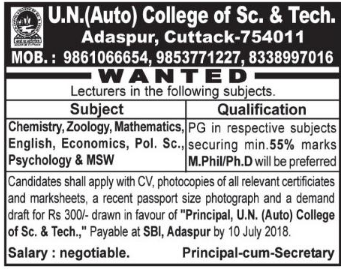 U.N. (Auto) College of Science and Technology, Cuttack has advertised in SAMBAD newspaper for the recruitment of Lecturers job vacancies. Interested and eligible job aspirants are requested to apply with in 10th July 2018. Check out further more details below. About College: The Udayanath Autonomous College started with a noble donation has now grown to be a standard institution in the locality within a span of 25 years. It is the only Autonomous College in the rural area of the state as of now. The institution is placed away from the hassles of the market place giving it a peaceful location and its greeneries give it a traditional Gurukul atmosphere which is very conducive to intellectual enrichment. It was initially established as a tiny Rural College. Later on, it developed into a Degree College, having Humanities, Science and Commerce. It became a full-fledged undergraduate college in 1991. In 2003-04 it was recognized by the U.G.C. under section 2f of its Act as an undergraduate college. It was also included in the same year under section 12B of U.G.C. Act.